You can make a beautiful hole smoothly. I make it solid, but if there is a spring in it, I can say it. This review is about item#2458495. I use it in a drill machine. The cut is also quite satisfactory. This review is about item#2458364. I used it for drilling a 5 mm thick stainless steel plate. It seems that it is a little thick, I felt 3 mm thick is appropriate. This review is about item#2458321. There are only famous manufacturer items and sharpness is good. I think that the center drill is a little long. This review is about item#2458382. I opened holes in 10 square shaped steel materials, but it seems likely that the hole saw is still going, I wonder if the center drill has run out. I bought one for spare but it seems to be useless for a while. This review is about item#02458355. Because the price was cheap, I was wondering if I could not cut it much, but I am satisfied with the sharpness also for the price. I installed a hole in the stainless steel top board to attach the alkaline ion water conditioner to the sink. I could drill without difficulty. Speaking of greed, it was the best if there was enough depth to drill a reinforced plate under the stainless steel plate together. I could not penetrate because the upper side of the cutter was wider. This review is about item#02458434. 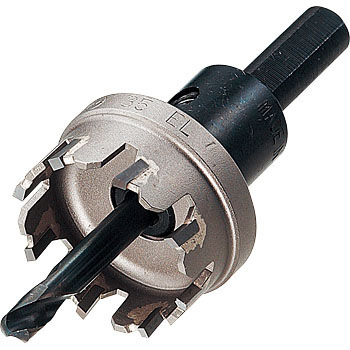 In the drilling of 2 mm stainless steel plate, it is difficult for inexpensive carbide cutters and bimetals to be inadequate, and again it is difficult unless it is of this class. As expected there are only maker items, it is expensive but it will expire well. This review is about item#02458321. This review is about item#02458382. It is outstanding sharpness that there are only maker items. Even cemented carbide is a stainless steel opponent and it can be used only a few times, so it will be nice to be a bit cheaper. This review is about item#02458452.